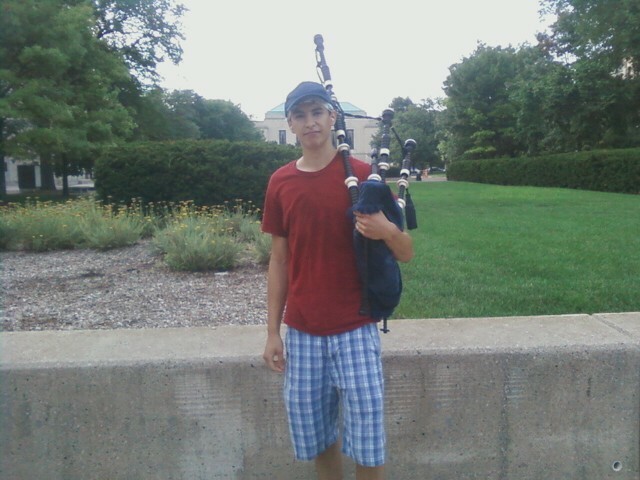 Did you hear the bagpipes on campus last night? It was Fonzie MacDonald. Not only does he have an awesome name, but this kid is pretty sharp. You know how I know? He was wearing ear plugs. Fonzie's no fool. He ain't gonna suffer hearing loss. Also, he isn't half bad at the pipes. @localinannarbor I love, love the idea of busking bagpipers. But surley it's too hot? @juliewbee Pipers busk all the time. Problem is, not all are good. Pipes love this weather, pipers not so much. @juliewbee Also, you get lots better money if you are wearing a kilt, but yards of wool aren't good for summer! Hello! Any chance I could get the original picture? I am looking to hire a bagpiper for my wife's 50th birthday. Are you interested?